The amount of energy used to maintain acceptable temperatures in the data center can be greatly reduced by containment. 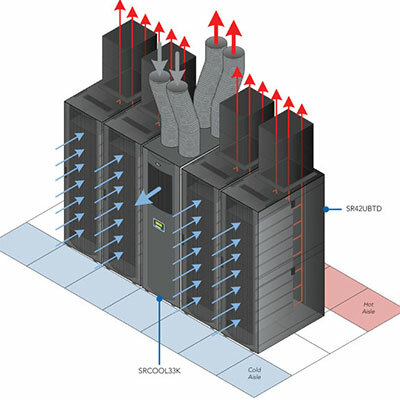 Data center containment is the separation of cold supply airflow from hot air coming out of equipment exhaust. By separating the air, you are able to save revenue by reducing your energy consumption, and improve overall equipment performance and efficiency. In order to determine which data center containment strategy is right for your data center or server room, you must look at the layout of the room, budget, and long-term goals. 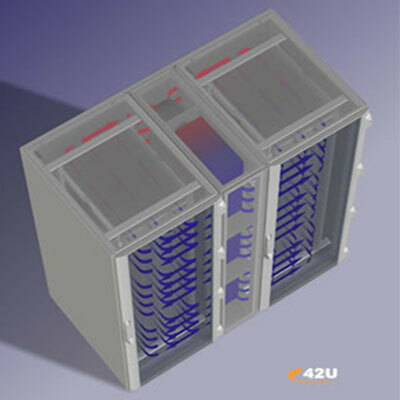 At 42U, we can help you determine which solution will fit your needs and go over each option in more detail.As part of your overall data center cooling strategy, you may also want to consider various airflow management infrastructure and power distribution strategies. Enclose a cold aisle with ceiling panels above the aisle, between adjoining racks, and with doors at the end of the aisle. Keep hot exhaust air, emitted from server racks, separated from the cold air. Push hot air through the chimney up to the ceiling return air plenum. An economical energy saving solution often utilizing curtain materials that have been around for a long time in clean rooms. 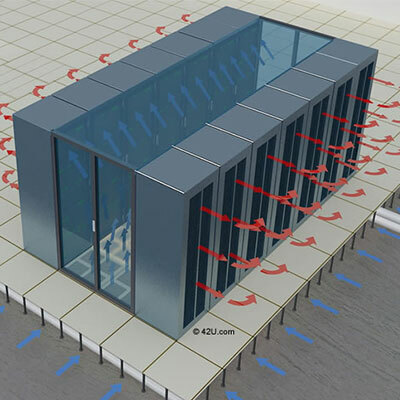 This unique hard panel roof fully segregates hot and cold air, improving the cooling capacity of any data center. 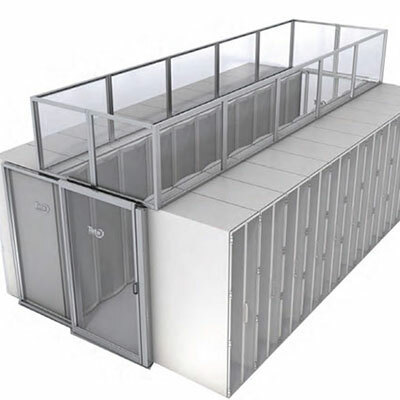 Get the benefits of traditional containment with greater flexibility and lower cost. Great for hot aisle/cold aisle containment applications, adapt to fit to existing racks, and can be configured to fit any site needs. Precisely cool and condition air in close proximity and is targeted cooling at the rows of server cabinets that fill the data center. The Cold Aisle Containment (CAC) approach encloses the cold aisle with ceiling panels above the aisle between adjoining racks and with doors at the end of the aisle. This allows the cold air from the perforated floor tiles in front of the cabinets to be contained and delivered to the server equipment air inlets. The CAC prevents cold air from mixing with warm air or being obstructed by surrounding equipment/sources before it reaches the servers. Because CAC possesses this ability, it is called focused cooling. Contact the local fire authority to discuss any aisle containment plans to make sure that codes are followed. Because the contained aisle approach separates the cold and hot air, the temperatures in the room will change. Room UPS and other equipment outside the cold row should be considered. Racks inside the aisle containment must be expanded in even numbers. Additional expandable aisle panels must be installed for odd gap openings in the row between racks. The data center should plug leaks both around the 19-inch rails in front of the racks and in the U space among the rack mounts by using blanking panels. Plug holes in raised floors around cabling with floor grommets. In its simplest form, Hot Aisle Containment (HAC) consists of a barrier that guides hot aisle exhaust airflow upward back to the CRAC (computer room air conditioner) return. This method keeps hot exhaust air emitted from server racks separated. Keep in mind though, while HAC improves energy efficiency compared to no HAC; it can add cooling (and power) load because of larger fans to overcome additional pressure drops. ✓ One redundant cooling unit can serve several aisle containments. ✓ HAC with Inrow cooling improves energy efficiency compared to traditional raised floor cooling with HAC. ✓ Typically a rack hat style containment with end row doors. ✓ Minimizes cold and hot air mixing so the return temperature to the CRAC is higher. ✓ HAC with Inrow cooling can cool more than 30kW heat load per rack. The open air distribution increases the risk of providing the servers with input air that is not the required temperature. Air temperatures can exceed acceptable levels for personnel working in the aisle. The hot return air must be ducted all the way from the HAC to the air inlet of the CRAC. This typically entails using the overhead plenum for return air (if possible), ducting between the HAC and ceiling plenum, and ducting between the ceiling plenum and the CRACs. A chimney system consists of a solid metal chimney that extends from the top rear of the IT racks. The hot air is pushed through the chimney up to the ceiling return air plenum. This type of system is highly compatible with most data centers due to the fact that it can be installed on an already existing enclosure. 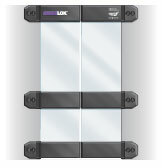 They can be installed not only on an individual cabinet but also on a system which can span several cabinets. ✓ Hot air is completely eliminated from the space and the room remains cool, in turn lowering operational costs. ✓ Increased flexibility with installation and configuration. This type of chimney system has a fan installed at the base of the chimney which will assist airflow and can respond based on temperature or pressure. This type of chimney system is used without a fan. Data center curtains are an economical energy saving solution often utilizing curtain materials that have been around for a long time in clean rooms. Combining the curtains with an aluminum track system allows you to attach the data center curtains to the drop ceiling and to the tops of the racks.More intelligently designed aisle containment curtains utilize UL listed fuse links. These melt at a temperature that is below the temperature at which your fire suppression system would be activated – 135 degrees is the melt point for them to drop away. This allows the curtains to drop to the floor before the temperature would be sufficient to trigger a data center fire suppression system. ✓ Increased energy efficiency and performance capability of climate control. ✓ Superior output density is facilitated, thanks to guaranteed cold air supply. ✓ Easily installed and retrofitted. ✓ An inexpensive way to boost the performance of your existing data center, lengthening the investment cycle until a replacement needs to be purchased. Hard panel systems work with both cold or hot aisle containment applications and are pre-assembled for easy installation. 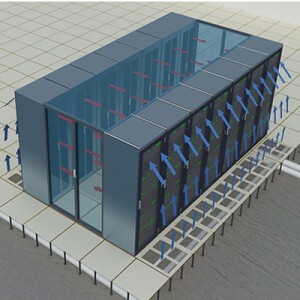 This unique hard panel roof fully segregates hot and cold air, improving the cooling capacity of any data center. It attaches to the top of the rack, fully supported by the racks, and lies flat to avoid interference with other overhead obstructions and extrusions. Should a fire occur, the roof panels drop away to allow an overhead suppression system to work within the aisle. ✓ Perimeter compression gaskets efficiently seal and minimize air leakage. ✓ Multiwall panel option adheres to new NFPA codes*. ✓ Ergonomically designed with angled handles to reduce pinch points. *Always check with local codes before any containment installation. 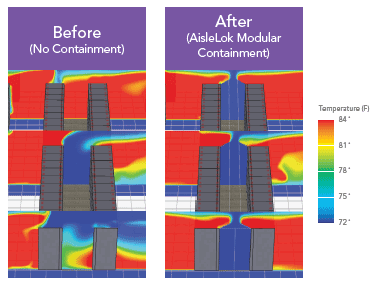 AisleLok Modular Containment is an off-the-shelf, out-of-the-box containment solution that can be self-installed in minutes. 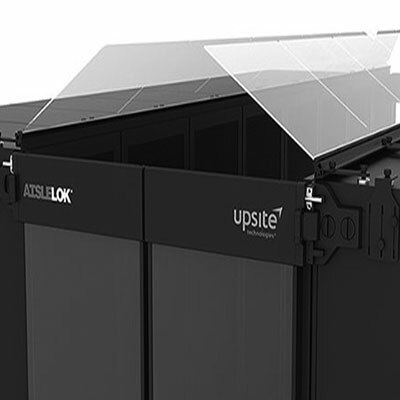 This innovative solution is the first of its kind in the industry, and provides data center managers an alternative to the complex traditional containment systems.AisleLok Modular Containment was developed to help data center managers achieve similar results to traditional containment (i.e. improved inlet temperatures), without all the complexities of measuring, designing, and installing. The unique design of the AisleLok modular aisle containment system attaches to the racks magnetically, creating a truly tool-less design that can be moved, reconfigured, and reused as many times as needed. The two main components of the AisleLok Modular Containment are the Rack Top Baffle and the Bi-Directional Doors, with an optional row gap filler. 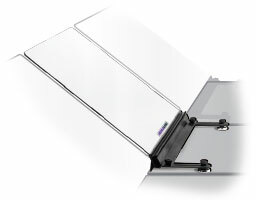 The Rack Top Baffle can be purchased in either a 30° angle from horizontal position (best for cold aisle containment), or in a vertical 90° angle from horizontal position (best for hot aisle containment). Both components attach directly to the racks. The open-sealing design ensures fire safety with an elegant appearance that brings professional aesthetics to your server room. Allows for higher rack densities. Enables lower inlet temperatures and reduced energy costs. Lower initial cost and lower total cost of ownership than full containment. Affordable to implement across multiple aisles. Easy installation – can be self-installed in minutes with no construction. Modular and flexible – can be reconfigured quickly and easily and applied to both hot and cold aisles. Easy to order with no custom measuring required. Can be self-installed in minutes without the use of tools. No construction means minimal disruption in computer room. Flexible design can be applied to hot or cold aisles. Can be reconfigured quickly and easily. Adapts to your computer room as it evolves. Easy to order; no custom measuring required. No 3rd party engineering, design, or installation required. This system is only effective for 12kW per rack loads and lower when using as cold aisle containment. Swinging doors attach to racks magnetically. Adjusts to fill in space between racks. Attaches magnetically between two racks. Attaches to top of rack magnetically. Available in 30° angle, and 90° angle. 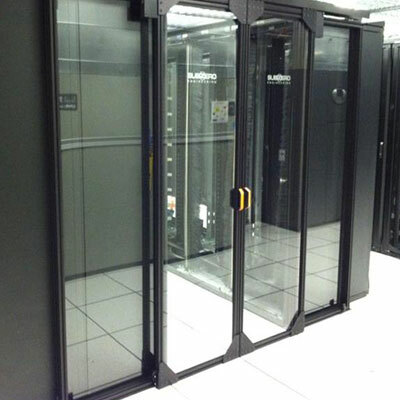 Closing the end of the aisles with a functional door system can not only optimize the design and operation of your data center, but it can also improve the efficiency. Aisle end doors are great for hot aisle/cold aisle containment applications, adapt to fit to existing racks, and can be configured to fit any site needs. When measuring for your door, please take into consideration any obstructions that might interfere with proper function or installation, e.g., cable trays, lighting, ducting, or conduits. Whether floor mounted or overhead, inrow cooling solutions consist of fans and a cooling coil. Depending on the product, the cooling coil will utilize chilled water or refrigerant as the cooling medium. In the case of refrigerant based units, they require a connection to a remote condenser system; while chilled water based units traditionally connect to chiller systems. ✓ Warm and cool air does not have far to travel. ✓ Allows the units to dissipate high heat loads quicker. ✓ Scalable approach to cooling your data center. The floor mount, inrow air conditioner couples the functionality of a perimeter CRAC (computer room air conditioner) unit with a significantly smaller footprint. These products are embedded in rows of data center cabinets, supporting a conventional hot aisle/cold aisle layout. Overhead units have a unique value proposition. Suspended from the ceiling or housed on top of a cabinet, these units conserve valuable floor space, leaving more room for servers, storage, and switches. Overhead systems allow cooling-strapped data centers to add capacities without new construction.